The executive and line officers for 2011 for Doylestown Fire Company No. 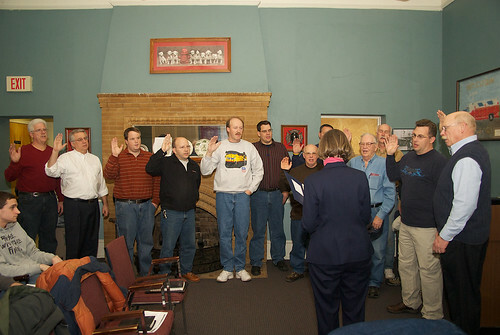 1 were sworn into their positions on Weds., Jan. 5 by Doylestown Borough Mayor Libby White during the fire company’s monthly business meeting at the Shewell Ave. firehouse. Lead by Chief Denny Loux, Jr., and President Bill Cope, the slate of elected officers will serve a one year term of office. Loux, serving his 7th year as chief, and Cope in his 6th as president, both come from firefighting families. The chief’s wife, Donna, is secretary and past president of the Auxiliary, father Denny Sr., is 1st Vice President and Captain of the Fire Police, brother Ed is one of the Chief Engineers and Communications Officer, and daughter Rebecca is a firefighter/EMT. Cope is the third member of his family to serve as president of the fire company. His late father Frank served from 1960-66 and brother John from 1993-97. Cope also serves as the engineer on the fire company’s antique Ahrens-Fox pumper and is a life member of the company. Filling out the ranks of the line officers for 2011 are- John “Ed” Truman, deputy chief, Paul Kreuter and Michael Wood, battalion chiefs, Doug Tilley, Captain, and Jeff Kennedy and James F. Shepard, lieutenants. The communications officers are Ed Loux and George Erb. On the executive side, the 1st Vice President is Denny Loux, Jr., 2nd vice president is Mark Hamilton, treasurer is Robert McCrillis. Assistant treasurer is Jay Stough, recording secretary is Peter Mills, assistant recording secretary is Roseanne Baughman. The trustees are Dan Kline, Bill Price, B. J. Loughnane, Kyle Downs, Jim Hampton and Larry Browne. After the officers of the fire company were sworn in, Mayor White also swore in the fire police officers for 2011- Capt. Denny Loux, Sr., 1st Lt. George Erb, 2nd Lt. Drew McPherson, Sgt. Gian Luiso, and officers Dennis Michener, Mark Hamilton and Sam Cramer, Sr.